29 March 2015, at 12:00a.m. Europe's share of global egg production is falling, according to industry analyst, Terry Evans. The ban on conventional battery cages for laying hens in the European Union from 2012 prompted short-term contraction in its member states, while output continued to increase in Russia and, to a lesser extent, Ukraine. 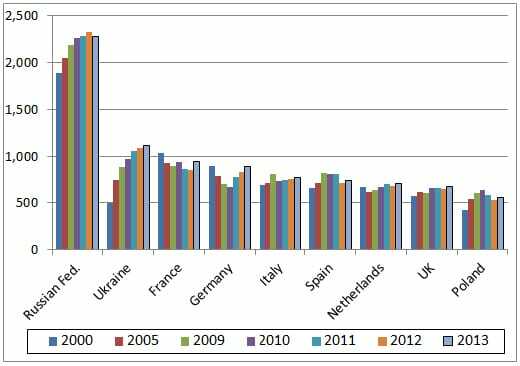 Egg production in Europe is increasing more slowly than in the other major regions of the world (Table 1 and Figure 1). Between 2000 and 2013 Europe’s egg growth averaged only a shade over one per cent per year compared with a global figure of 2.3 per cent. For the other regions, the corresponding rates were 3.9 per cent for Africa, 2.2 per cent for the Americas, 2.5 per cent for Asia and 3.6 per cent for Oceania. During the review period, egg output in Europe increased from 9.5 million tonnes to 10.9 million tonnes, while the world total rose from 51.1 million tonnes to 68.3 million tonnes. 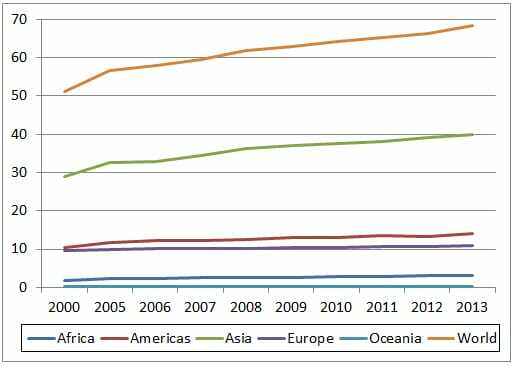 Thus, as a proportion of the global total, Europe’s share has contracted from 18.6 per cent in 2000 to just 16.0 per cent in 2013. As global production looks likely to continue to expand by more than two per cent per year, output in 2015 could well approach 71.5 million tonnes. As production in Europe could amount to 11.3 million tonnes, it would appear that this region’s contribution to the world total will slip below 16 per cent this year. The number of layers in Europe in 2000 came close to 700 million, of which 487 million were in the European Union (EU). Now, while the total for Europe has grown by almost 214 million at around two per cent per year to reach 913 million in 2013, the increase within the Community was just 0.2 per cent per year as numbers rose by just over 13 million to 501 million. EU members accounted for more than 70 per cent of total production in Europe back in 2000 but only 64 per cent in 2013 (Table 2) as output among these countries rose from 6.7 million tonnes to 7.0 million tonnes. This represented a growth rate of only 0.4 per cent per year. Hence, it is clear that production in the non-EU sector expanded more rapidly at some 2.6 per cent per year, as output escalated from 2.8 million tonnes to 3.9 million tonnes. Of this increase of 1.1 million tonnes, 625,000 tonnes came from Ukraine and 389,000 tonnes from the Russian Federation. In 2013, nearly 80 per cent or 8.7 million tonnes of Europe’s eggs originated in only nine countries (Tables 3 and 4), while just two countries – the Russian Federation and Ukraine combined produced more than 3.4 million tonnes or 31 per cent of the Europe total. A closer look at the leading producing countries (Table 4 and Figure 2) reveals that the top nine countries expanded their combined output by almost 1.4 million tonnes between 2000 and 2013 and in doing so, increased their share of the Europe total from 77.4 per cent to 79.5 per cent. Figure 2 clearly illustrates how, despite some annual movements in production in seven of the top countries, the broad picture for them shows little change over the period in stark contrast to that for the Russian Federation and Ukraine. Many of the countries in the top half of Table 2 witnessed a contraction in production when comparing 2013 with 2000, while nearly all of the industries in the bottom half reported expansion. Based on these Food and Agriculture Organisation (FAO) figures, which include hatching eggs, the egg industry in the Russian Federation expanded by 1.5 per cent per year to reach 2.33 million tonnes in 2012 although 2013 witnessed a slight cut-back. However, another source has indicated a much more significant cutback in that year. The latest reports reaching ThePoultySite indicate that a 0.3 per cent increase in egg output occurred in 2014 to around 2.1 million tonnes. All the layers are kept in cages, while the split between brown and white eggs is broadly 50:50. While the industry of Ukraine recorded a strong 6.5 per cent growth rate over the review period as production climbed to exceed 1.1 million tonnes, the rate of increase has contracted to less than half this amount in recent years. All birds there are housed in cages. Although production in France appears to have recovered in 2013 to 944,000 tonnes, this was still some nine per cent below the 2000 level. In 2013, it is estimated that 68 per cent of the flock was in a cage laying system, 25 per cent on free-range and seven per cent in barns. Because the ban on conventional cages systems was introduced in Germany prior to it being applied to the rest of the EU, domestic production there contracted to 662,000 tonnes in 2010. Since then, the size of the flock has recovered, pushing egg output to 893,000 tonnes in 2013. More than 64 per cent of birds are kept in barns with 24 per cent on free range and fewer than 12 per cent in enriched (colony) cages. In Italy, since 2010, the egg industry has recorded a small near two per cent increase, even so the 2013 level of 775,000 tonnes was below the 2009 record of 813,00 tonnes. There has been a rise in the proportion of birds kept in barn systems at the expense of cages. The bulk of eggs are brown-shelled. Conventional cages were banned in the EU from January 2012, forcing producers to choose between enriched (colony) cage systems, barn systems or free range. This could well be the main reason why production in Spain in 2012 and 2013 fell well short of the levels achieved between 2009 and 2011. In 2013, some 93 per cent of birds were housed in enriched cages, 2.5 per cent in barns and 4.5 per cent on free range. The brown to white ratio is 90:10. FAO data on hen egg production in The Netherlands is somewhat distorted by the number of hatching eggs produced. According to International Egg Commission (IEC) statistics, Dutch table egg production in 2013 amounted to 625,000 tonnes, down from 636,000 tonnes in 2012 and 660,000 tonnes in 2011. More than 69 per cent of the flock is housed in a barn system, 24 per cent are on free range, with fewer than seven per cent in cages. The brown to white ratio is 55:45. The IEC’s estimate of table egg production in the United Kingdom in 2013 showed an increase of four per cent at 592,000 tonnes. The split between those in a cage or non-cage system is roughly 50:50. Almost all the eggs are brown-shelled. Although egg output in Poland increased in 2013, it was still below the 2011 level. Some 90 per cent of the birds are in cages, eight per cent in a barn system and two per cent on free range. The brown- to white- shelled egg ratio is 90:10.